Thank you for visiting Adapt Prosthetics and Orthotics located at 2204 Ironwood Place Suite A Coeur D Alene, Kootenai County, Idaho 83814-2662. We accept medicare, medicaid, blue cross, blue shield, group health, and most other major insurance payers. Our Mission: To help pediatrics and adults afflicted by disease or disability achieve their maximum level of function through the use of orthotic and prosthetic devices. 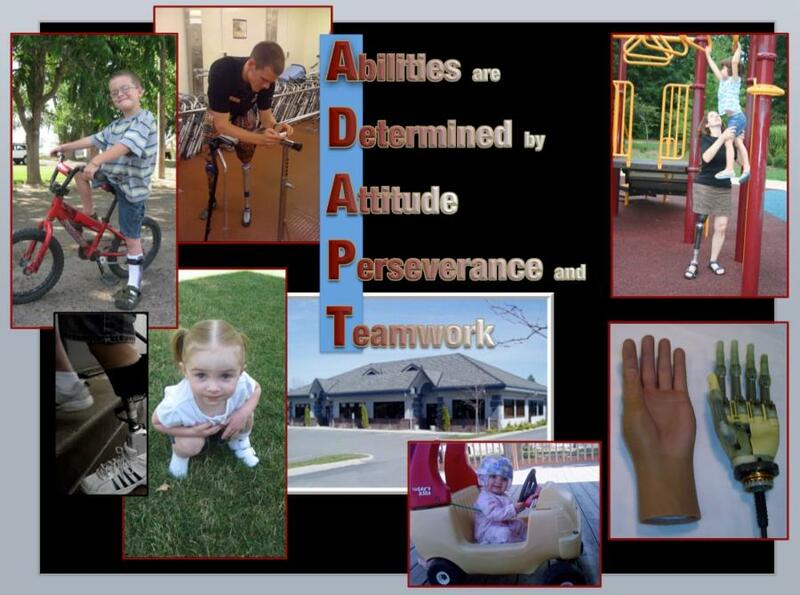 What We Do: Adapt Prosthetics and Orthotics LLC (APO) is a company specializing in prosthetic and orthotic devices. These devices help persons suffering from amputation, neurologic disorders, and musculoskeletal impairment become as functional as possible with their disability. We offer a full spectrum of products and services to help patients maximize their physical potential and improve their quality of life. We provide various prosthetic and orthotic bracing systems including: Ottobock's c-leg, varying mpk ‘s, plie, rheo, i-limb, Ottobock's Michael Angelo prosthetic hand, myoelectric systems, custom and cad/cam based designed spine bracing, custom orthotics. We treat patients with cerebral palsy, spina bifida, stroke / cva, amputation, tbi, scoliosis, spinal trauma, fractures, and other neurological and musculoskeletal deficiencies. Our Clients: Our clients are persons with physical disabilities. This includes pediatric, adult and elderly populations. We provide prosthetic and orthotic service to Coeur d'Alene ( CDA ) specifically but also Northern Idaho and Eastern Washington. We provide prosthetic and orthotic devices, but not durable medical equipment. We do not provide physical therapy, occupational therapy, or vocational therapy but we do work closely with your therapists to help you use your prosthetic ( artificial limb ) or orthotic ( brace ) to the best possible outcome. We treat patients with plagiocephaly, cerebral palsy, spina bifida, stroke / cva, amputation, tbi, scoliosis, spinal trauma, fractures, and other neurological and musculoskeletal deficiencies. Company Vision: APO will provide service to clients in Coeur D Alene ( CDA ), Sandpoint, Northern Idaho and Eastern Washington. The population in and around Couer D’Alene is currently underserved. As a whole, the need for certified prosthetists and orthotists across the U.S. is expected to increase significantly in the next 20 years due to the aging baby boomer population and the increasing rate of obesity and diabetes. We want to be the preferred provider of orthotic and prosthetic devices in the region. We have the experience, dedication, and drive to provide our clients with the tools to adapt, improvise and overcome limitations in order to lead a better life. This statement has been reduced in font size to improve the fit and feel of the site overall. This text exists in order to make it easier for you to find us on the web via the various search engines. As you know, there are only 3 prosthetic & orthotic companies providing service in Kootenai County, and it can be hard to find any of the three prosthetic & orthotic companies online due to Internet search engines being overloaded. This website relates to: Kootenai, prosthetics, orthotics, durable medical equipment, orthotics, physical therapy, orthotics, occupational therapy, artificial limb, brace, bracing, cleg, c-leg, mpk, coeur, prosthetic, cda, coeur d'alene, coeur d alene, idaho, prosthetics, ironwood, vocational therapy, prosthetics, spine, orthotics, scoliosis, prosthetics, cerebral palsy, spina bifida, stroke, cva, prosthetics, rehabilitation, rehab, prosthetics, medicine, therapy, prosthetic, amputation, prosthetics, plie, rheo, advanced, cad/cam, cast, manufacturing, prosthetics, medicare, medicaid, blue, group, prosthetist, orthotist, CP, CO, CPO, i-limb, michael angelo, myoelectric, arm, leg, drop foot, Kootenai orthotics, Kootenai medical center, amputee, Ottobock, Washington. Any patient of ours that reads this far, has earned a free ADAPT t-shirt—just talk to Chris.